Apple added The Interview to iTunes on Sunday, three days after Google's YouTube and Google Play, as well as Microsoft's Xbox Video services launched the movie. The low-brow comedy starring Seth Rogan and James Franco had been pulled from distribution after the largest U.S. theater chains backed out of showing in the wake of terrorist attacks by a North Korean hacker group called Guardians of Peace (GOP). Apple has apparently been offered an exclusive deal to distribute the movie by Sony. According to The New York Times, Sony asked the White House for help getting Apple on board. The same report said Apple wasn't interested, at least not in Sony's timeline. On Christmas Eve, Google and Microsoft both launched it for rent and purchase through the above-mentioned services. Apple's iTunes did not carry it, however, garnering media attention from this site and other Mac sites, as well as mainstream media outlets, for not offering it. The stakes were fairly clear: a state-sponsored criminal ring hacked Sony in stated-retaliation for Sony producing The Interview. The same group then released financial and personal information for a multitude of Sony employees, as well as unreleased films and scripts—more importantly, it said it would release more if Sony didn't pull The Interview. To its credit, Sony didn't cave in, at least not until the cowardly suits running some of the U.S.'s largest theater chains canceled the film in the wake of cartoon-like threats of terrorism against their chains. At that point, Sony pulled the film, a move which was met with criticism from Hollywood to the White House. Sony and Google agreed that we could not sit on the sidelines and allow a handful of people to determine the limits of free speech in another country (however silly the content might be). Apple didn't announce the film, but the company did give a statement to Reuters, saying, "We're pleased to offer 'The Interview' for rental or purchase on the iTunes Store." Personally, I'd have been pleased-er if Apple had it first and made a big splash about the importance of artistic expression in a free society. But, better late than never—and in the long run few will remember this incident. 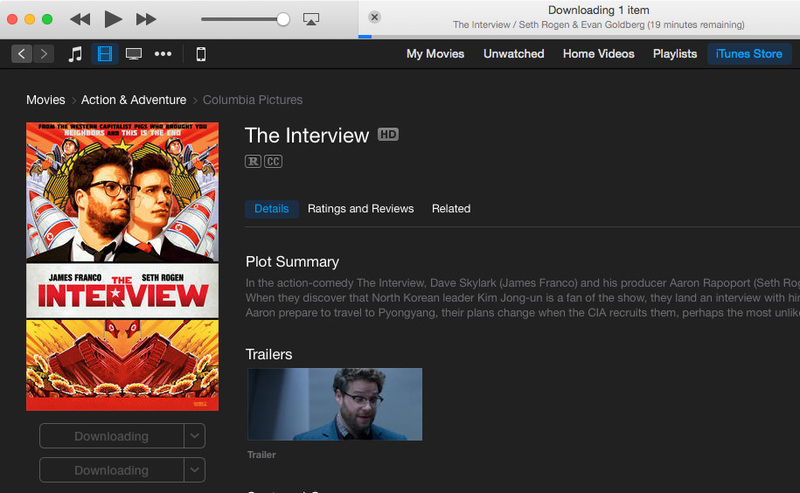 You can rent The Interview for US$5.99 from iTunes. Purchasing the HD version is $14.99. It's not getting great reviews, but I personally bought it just to spite the half-pint, delusional nimrod in charge in North Korea. Speaking of which, it's time to grab Team America: World Police by Matt Stone and Trey Parker, even though the cowardly suits at Paramount pulled it when indie theaters wanted to sub it for The Interview. This movie uses the current North Korean dictator's father as its punching bag.